AIRCRAFT / BOAT KITS Aircrafts Aircraft Parts / Accessories Boats Boat Parts & Accessories BATTERIES / CHARGERS / POWER SUPPLY Accessories Battery Packs Chargers / Power Supply Charging Adapters Misc. Parts ELECTRIC MOTORS / SPEED CONTROLS Electric Motors Speed Controls Wires / Accessories FLIGHT SIMULATORS & ACCESSORIES Flight Simulators Parts / Accessories GLOW PLUGS / STARTERS / CONNECTORS Electric Starts / Start Box Glow Plugs Misc. Connectors Other Plugs Pull Starter MOTOR BIKES / ACCESSORIES Motor Bikes / Dirt Bikes Parts & Accessories OIL / GLUE / GREASE RADIO / RECEIVER / SERVOS Radio Systems Parts & Accessories Receivers Air Surface Servos Misc. Parts TOOLS & OTHER PARTS WHEEL / TIRES / RIMS Accessories Wheel / Tires / Rims Sets CARS & TRUCKS Accessories (Stands, Shocks, etc.) Bodies / Lights / Accessories Engines & Accessories Engines & Accessories Accessories (Glow Plugs, Temp Guns, etc.) Nitro Engines Parts (Tune Pipes, Gas Kits, etc.) Transmissions, Gears, Pionions, etc. PARTS BY VEHICLE Axial Vehicle Parts Gmade Vehicle Parts HPI Vehicle Parts Kyosho Vehicle Parts Losi Vehicle Parts Traxxas Vehicle Parts Vaterra Vehicle Parts Venom / Atmoik Vehicle Parts Misc. Parts HELICOPTERS / QUADCOPTERS PARTS & ACCESSORIES HELI ENGINES & ACCESSORIES Engines & Parts Tune Pipes / Mufflers Motors & Speed Controls Misc. Parts PARTS BY HELI Align Heli Parts Blade Heli Parts DJI Quadcopter Parts E-Flite Parts Gaui Heli Parts Heli-Max Heli Parts Nine Eagle Solo Pro Parts Traxxas Heli Parts Esky Heli Parts Estes Parts SAB (Goblin) Parts Walkera Heli Parts SLOT CARS & SETS Parts & Accessories Slot Cars Slot Cars Tracks / Sets TRAINS & ACCESSORIES Adhesives / Fields / Tools Building / Bridges / Tunnels Figure / Track Side Accessories Grasses / Trees / Scenery Parts & Accessories Power Supplies / Transformers Trains / Tracks / Sets AIRSOFT GUNS & ACCESSORIES Airsoft Guns / Pistols Airsoft Battery Packs Airsoft Chargers / Power Supplies Airsoft Parts & Accessories PAINTS & ACCESSORIES Air Brush Accessories Air Brush Sets / Compressors Paints Paint - Acrylic Paint - Aerosol / Spray Cans Paint - Aircraft Paint - Air Brush / Bottles Paint - Enamel Paint - Lacquer Paint - Polycarbonate Paint - Railroad Paint Masks & Decals Menu Aircrafts / Boat Kits & Parts Airplane / Helicopters / Quads AirSoft Guns & Accessories Batteries & Chargers Cars & Trucks Electric Motor / Speed Control Flight Simulations Models / Rockets Motor Bikes & Accessories Oil / Glue / Greeas Other Hobbies Other Parts Paints & Accessories Parts by Heli Radio / Receiver / Servos Shop by Manufacturer Slot Cars & Accessories Tools / Misc. Parts Trains & Accessories Wheels / Tires / Rims Other Add NZ Hobbies to your Favorites and receive our email newsletters about new items and special promotions. Castle Creation MAMBA MICRO X 12.6V ESC, 2A PEAK BEC W/ Posts Crawler Edition Click Thumbnails to Enlarge STOCK STATUS : ITEM CONDITION: Brand New Factory Packed WARRANTY:100% Covered under Manufacturer Warranty RETURNS:Hassle Free Return COMBINE SHIPPING:We do offer combine shipping discount for multiple items. Please contact us before placing the order. Authorized DealerIn-Stock Ship within 24 Hours The Mamba Micro X Crawler Edition ESC is a great option for weight conscious, competition oriented crawlers and trail runners in vehicles weighing up to 8lbs on 2S or 3S. It can also be used in slightly more aggressive applications like rock racing and hill climbing on vehicles up to 4lbs. This SPECIAL EDITION of the Mamba Micro X features motor solder posts with factory installed 16 AWG wire and 4mm female bullets for the motor connection; it also includes the matching 4mm male bullets to attach to your motor. Your ESC will come with V2.02 firmware factory installed that has been enhanced for rock crawling and sensored operation. 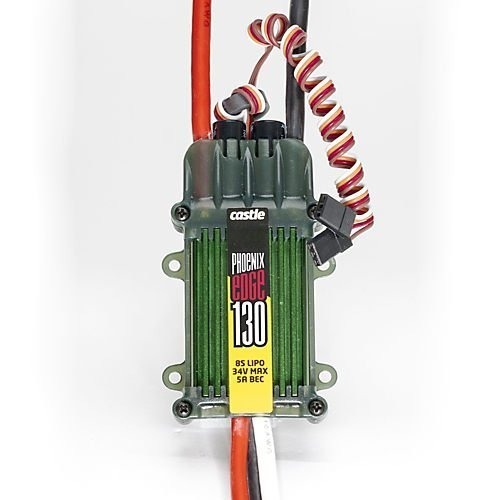 Pair this ESC with any of Castle's "Slate" crawler motors, or similar low KV short can options like the Holmes Hobbies Puller Pro 540 "Stubby" (less than or equal to 2700kv) NOTE: Use of an external BEC is required if running a high power or digital servo. If you're looking for a more aggressive setup in a heavier rig, like rock racing and extended hill climbing, Castle recommends the Mamba X ESC. 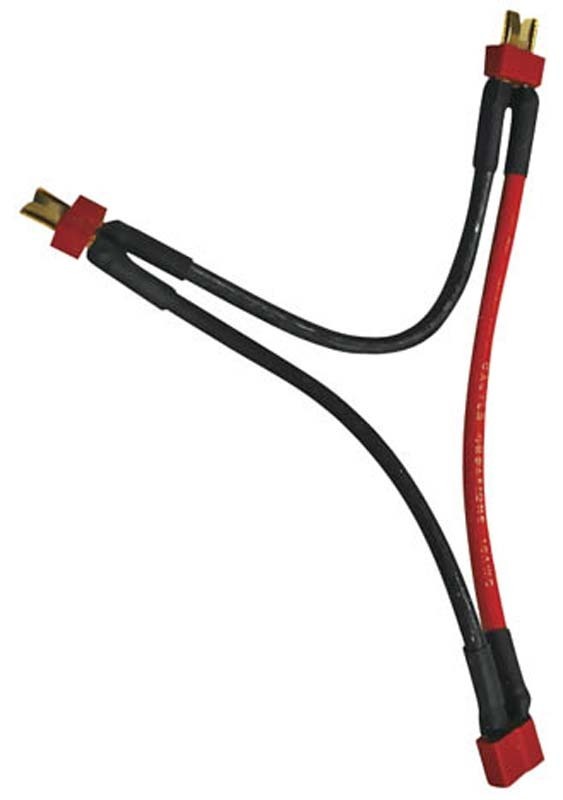 Features: The Auxiliary Advantage: Mamba Micro X features the addition of a programmable Auxiliary Wire that allows you to make “on-the-go” adjustments to several settings such as torque control, and max throttle, and fine-tune the performance of your ESC right from the transmitter using an auxiliary channel on the receiver. The AUX wire function is disabled by default but is programmable via Castle Link. Once you have programmed the functionality of the AUX wire, that setting can then be adjusted on-the-go from a compatible transmitter. Try out the brand new Crawler Mode for incredible versatility! Telemetry Capability: The Mamba Micro X is telemetry ready, which means owners of Futaba T4PX Transmitters will be able to purchase the Castle Telemetry Link for S.BUS2. Real-time data such as ESC temperature, voltages, and RPM can be monitored to ensure performance advantages and spare you the “unknown” parameters that all R/C enthusiasts experience at some point. Telemetry data provides another level of protection and can increase performance. 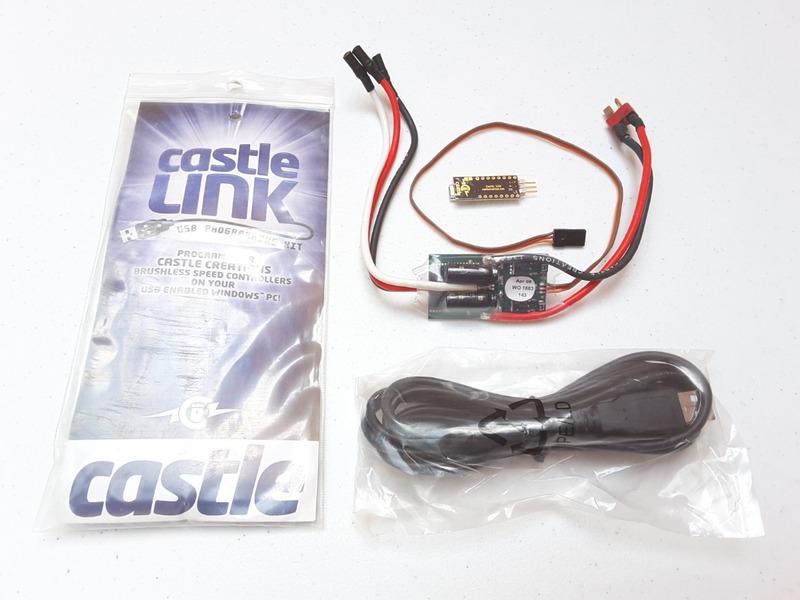 Castle Link Compatible: With the optional Castle Link USB Programming Kit you can use your Windows™ PC to easily program your controller. Adjustable settings include: Throttle curve Braking curve Drag brake Auto LiPo cutoff Punch Control Reverse Type Motor Type Additional Castle Link benefits include: Access to all firmware updates, including added features sets released from Castle Engineering, at no charge. Intuitive Demo Mode capability. Ability to save setup profiles for later use. Specifications: Input Voltage Range: 2S (7.4V) - 3S LiPo (12.6V) BEC Specifications: Adjustable: 5.5V or 7.5V (2A Peak), default 5.5V. Use of external BEC is recommended if using a high torque/speed digital servo; the CC BEC or CC BEC 2.0 Waterproof are recommended Operating Environment: Waterproof* design allows for use in nearly any environment. Brake: Proportional Reversible: Yes, but can be disabled for racing On/Off Switch: Yes, waterproof* Cooling Fan: No Length: 1.6" (41mm) Width: 0.75" (19mm) Height: 1.1" (28mm) Weight (without wires): 1.20 oz. 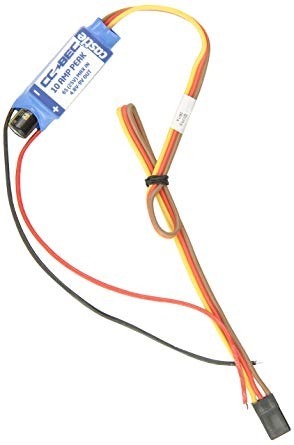 (34g) Connectors: 4mm male Castle Bullet Connectors w/16 gauge wire; Castle sensor harness Items Needed for Operation: Battery Connector required, Castle 4mm polarized Connectors, Deans Ultra Plugs, or Traxxas Power Connect are recommended. Application Guidelines: Low speed crawling or trail running in vehicles weighing up to 8lbs. 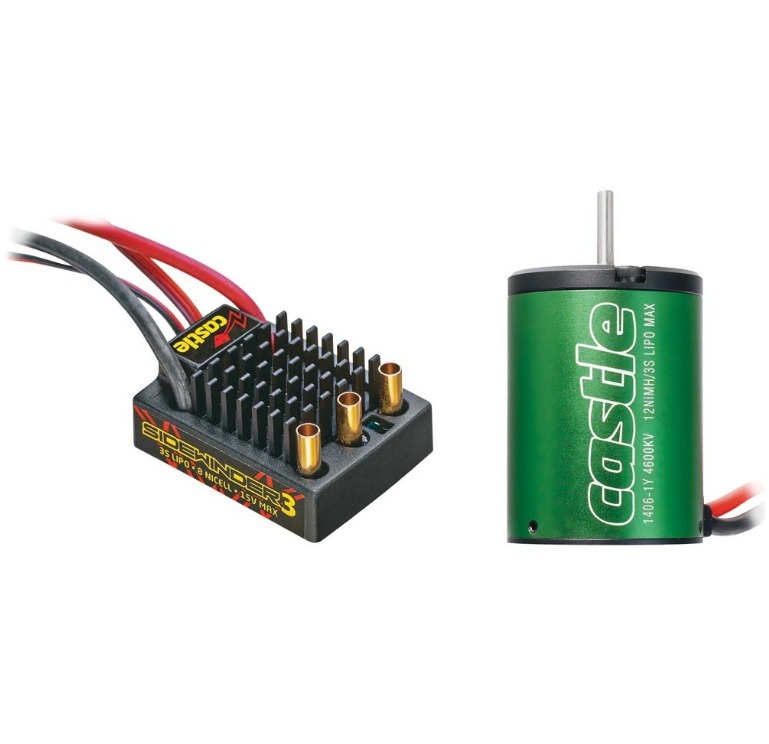 Recommended Motors: Castle's "Slate" crawler motors or Holmes Hobbies Puller Pro 540 "Stubby" (less than or equal to 2700kv) Max. Recommended Vehicle Weight: 8lbs when used for low speed/moderate driving style; 4lbs for more aggressive driving styles. Programmability: Fully programmable Castle feature set using Castle Link USB adapter (coupon for free link included in package) and freely downloadable Castle Link Windows software. Telemetry Link Capable: Yes Data Logging: No Tech Notes: *Not intended for operation while submerged in liquid. If unit is operated in wet conditions, rinse with fresh water to remove dirt or corrosives, then fully dry unit. 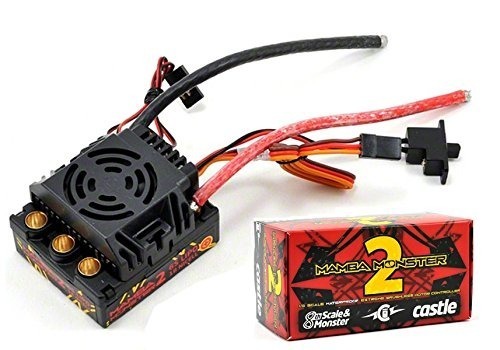 Includes: Crawler Edition Mamba Micro X w/solder posts Castle Sensor Harness adapter Coupon for free Castle Link USB adapter Driver's Ed and Quick Start Guides Castle decal sheet Product Use Statements: Applying voltages higher than 12.6 volts will cause irreparable damage to your controller, voiding your warranty. Recommended battery capacity is at least 1500mAh and 25C. Castle recommends running the highest mAh that will fit in your vehicle and the highest C rating you can afford. The Crawler Edition Mamba Micro X has solder posts for the motor connections; includes 13 gauge wire with 4mm female bullets that connect directly to Slate motors and the battery input wires are bare. You must solder the battery connector to the wires on the ESC. Payment Terms Payment Terms Payment TermsWe accept PayPal only. Credit card payment also accepted through PayPal. 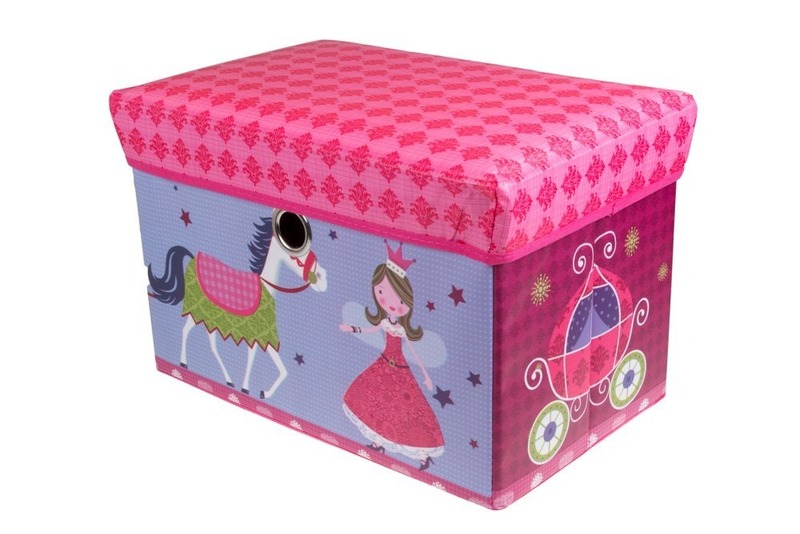 Make sure you select the correct Postal address when paying for this item. Winning bidders must pay within 7 days. Shipping Terms Shipping Terms Shipping TermsWe ship to Worldwide. All items are shipped out thru USPS unless otherwise. Majority of packages arrive between 2-5 days. USPS does not allow a claim to be filed until 45 days has passed. Please work with us to resolve any issues. Please email us to contact us through eBay. All Items Ships in 24 Hours from Monday to Saturday after receiving the payment. We only ship to your PayPal address so please make sure it is correct before you check out. International buyers please read this before buying any item from us: Any order shipped outside of USA is sent using United States Postal Service . Once shipped the average delivery time is estimated at 14-21 working days. However, sometimes there are delays caused by the US Postal Service and international customs agents that are outside of our control. Although rare, these delays can cause shipments to take several weeks before they arrive at their destination. International buyers are responsible for their customs fee. Combine Shipping Policy We provide combine shipping to all our valued customers (Domestic & International Both) to save their dollars. All you have to do is buy as many item as you want to and then wait for our combine shipping invoice as eBay do not provide such facility so we have to do it manually and we do that throughout the day. Please note that DO NOT pay at the time of purchase and wait for the combine invoice otherwise we are not able to refund you extra money. If you have any query, feel free to contact us through eBay. Returns Policy Returns Policy Returns Policy 14 day return policy on Brand New/Un-Open items only. Full refund minus Shipping and Handling. Buyer will pay return shipping charges. As an Authorize Dealer everything we sell is fully covered by manufactured warranty. So warrantied or Defective Items Must Be Returned Directly to Manufacturers. Please contact us before any returns. Feedback Feedback FeedbackFeedback is important to all of us participating on the eBay community. We will leave you a feedback as soon as we receive the payment from you. Please make sure you contact us before leaving a negative or low feedback. There are always ways to work things out to meet your satisfaction. Every customer is important to us. Home / About Us / Our Policies / FAQ / Contact Us / View All Listings Copyright © 2017 NZ Hobbies, All rights reserved.